He added that preparations are underway by Secretary of State Mike Pompeo for a second presidential meeting with Kim "quite soon." A better-than-expected outcome of the summit between the two Koreas immediately kick-started stalled negotiations between Washington and Pyongyang, boosting President Donald Trump’s high-stakes push to get the North to give up its nuclear weapons by the end of his first term in office. Trump and Moon are expected to sign a new version of the U.S.-South Korean trade agreement, one of Trump's first successes in his effort to renegotiate trade deals on more favorable terms for the U.S. Even so, some U.S. officials worry that South Korea's eagerness to restore relations with the North could reduce sanctions pressure on Kim's government, hampering efforts to negotiate a nuclear accord. The nuclear threat was on the agenda at Trump's first meeting in New York, a dinner with Japanese Prime Minister Shinzo Abe in Manhattan on Sunday night. Abe stands first among world leaders in cultivating a close relationship with the president through displays of flattery that he has used to advance his efforts to influence the unpredictable American leader. "We have our eyes wide open," Pompeo told NBC's "Meet the Press" on Sunday. "There is a long ways to go to get Chairman Kim to live up to the commitment that he made to President Trump and, indeed, to the demands of the world in the U.N. Security Council resolutions to get him to fully denuclearize." Top U.S. diplomat Mike Pompeo said Sunday that economic sanctions on North Korea won’t be reduced until it completes “denuclearization” after leader Kim Jong Un offered to close the North’s main nuclear site in exchange for U.S. concessions. Trump, redoubling his commitment to "America First" on the most global of stages, will stress his dedication to the primacy of U.S. interests while competing with Western allies for an advantage on trade and shining a spotlight on the threat that he says Iran poses to the Middle East and beyond. Scores of world leaders, even those representing America's closest friends, remain wary of Trump. In the 12 months since his last visit to the U.N., the Republican president has jolted the global status quo by pulling out of the Iran nuclear deal, starting trade conflicts with China and the West and embracing Russia's Vladimir Putin even as the investigation into the U.S. president's ties to Moscow moves closer to the Oval Office. 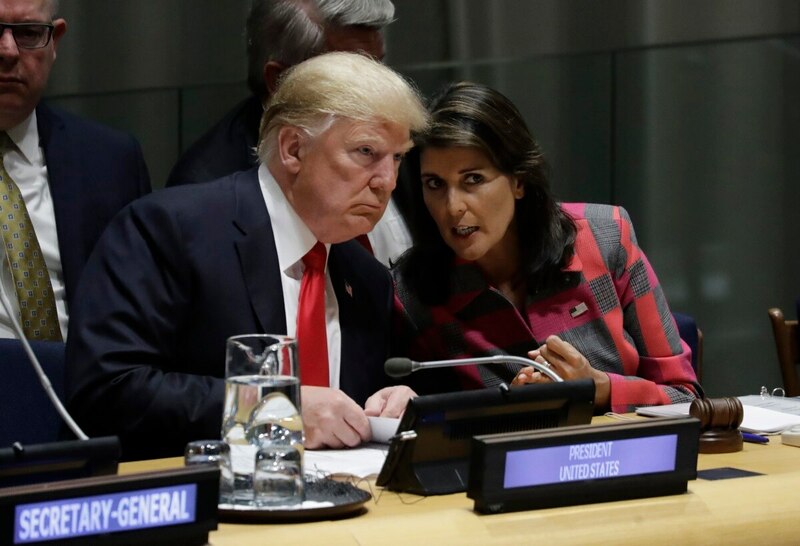 Nikki Haley, the U.S. ambassador to the United Nations, told reporters in a preview of Trump's visit that the president's focus "will be very much on the United States," its role and the relations it wants to build. In his four-day visit to New York, Trump will deliver major speeches and meet with representatives of a world order that he has so often upended in the past year. On Monday he participated in a Global Call to Action on the World Drug Problem and later was to meet with Egyptian President Abdel-Fattah el-Sissi and French President Emmanuel Macron, in addition to Moon. Trump is also expected to deliver a fresh warning to Syria’s Bashar al-Assad that the use of chemical weapons against civilians in the major rebel stronghold of Idlib would have serious repercussions.